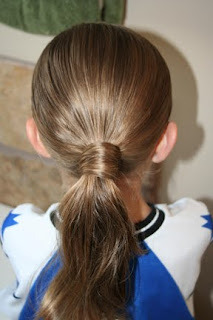 This is a very quick and easy hairstyle for those mornings when you simply to not have enough time at all! As simple as it is, the ‘do looks quite elegant and you will get compliments! Tweens, teens, and moms can even sport this hairdo… and it is simple enough that a daddy can do it (we list this as a Daddy ‘Do because my husband did on our other daughter right after filming this)! It also holds up super well without bobby pins… repeat… WITHOUT BOBBY PINS! Check out the video to see how I did it! Items Needed: 1 large hairband, rat-tail comb (to help part hair), Topsy Tail tool (available in my left sidebar), hairspray (to help with fliers). If you like this hairdo, feel free to let us know! Happy Hairdoing!